More than a year ago, I happened upon a Playstation indie game with a refreshing yet nostalgic premise: explore a platforming map whilst leveling and developing a character in true RPG fashion. I was curious, and we reached out to developers Ska Studios to find out more about the game. Over the year, Castielle published an interview and did some alpha streams with the very approachable Ska Studios team. The game was delayed and hype mounted as people’s expectations for the game grew with each new reveal. I decided to not play the alpha version on PC, and waited for the PS4 version to get the true experience that other players would get. And now, here it is! 17.99 on the Playstation Store, with Vita cross-buy for the future handheld release. PC gamers will get their version in the next few months. The game takes place on a forsaken island, where beings born of the salt follow their respective quests and fight for their survival. Much like the Souls series, the game refrains from spelling out things and instead carefully threads the lore and background of each NPC, spell, item and enemy behind descriptions accessible through the menu on either your inventory or the bestiary. Characters will provide cryptic dialogue and hints to their intentions and whereabouts, but if you would like to truly understand the Island’s condition, you will have to diligently pick up and read many an item description. This is my preferred approach to storytelling, as it allows for detailed crafting of a world without subjecting the player to awkward or slow cut-scenes or dialogue sequences. For those who do not know, Ska Studios is actually just two people: James and Michelle Silva. I mention this because the Salt and Sanctuary experience is so impressive that this little fact seems impossible to believe. All of the world’s visuals have been lovingly and skillfully handcrafted, creating a unique but harmonious feel for each enemy, boss, location and weapon. Animations flow smoothly into one another, never seeming out of place or sacrificing design for gameplay. As you progress through the game, you begin to notice details in the artwork that convey that feeling of solitude and incite the desire to persevere that so many fans hold dear from Demon’s Souls days. The music score is equally enthralling. Although the start screen music is a bit high-pitched for my liking, the in-game audio is comprised of Ska-made tunes that perfectly match the desolate and at time intense nature of the Island. I am particularly fond of the boss themes, which set the mood for an intense hack-and roll fight, and the endgame’s slow and subtle cues that mellow you into New Game Plus. The most important part of a game is most certainly how it plays, and here is where Salt and Sanctuary truly shines. You begin your journey by picking a class and starting gift, which tailors your starting equipment as you face an insurmountable challenge. When you (most likely) fail, you arrive at the Island and begin to realize there’s really a lot more than meets the eyes. The game briefly introduces you to the concept of Sanctuaries and Creeds, but does not reveal the real complexity behind them. There are hidden and requirement-locked creeds, there are devotion levels and rewards for each different allegiance, and each creed not only gets a custom ending but also determines the appearance and stock of your Sanctuary’s vendors. You won’t know any of that to begin with, and as you foolishly move forward with the game you will begin to find some weapons that look interesting, and eventually realize that they can be upgraded, they have scaling, and feature special movesets and hidden properties such as faster attack speeds. This is just the tip of the iceberg, as if you are lucky enough you won’t skip a specific vendor that transmutes weapons using boss and regular enemy remains, and creates amazing looking and incredibly powerful uniques. But what would you do with these 100+ weapons and their movesets if you wanted them to be even more versatile? You would match them up with an insanely detailed skill tree, of course! Leveling up is never a bore or a waste, as there is a level cap of 500 and the average playthrough ends at levels 70-80 in about 20+ hours. Do you want to be a Magic-only build? Go for it, there’s two entire sections of the tree that specialize in spells and prayers, and a further one for light armor. How about a Spellsword? Worry not, you are well-catered to with Strength and magic scaling boss weapons. And a rogue? Oh yes, there are not only bows and crossbows to match your dexterity tree, there are also guns! All of this closely intertwined with your leveling choices and upgrade options, allowing players to have unique gameplay experiences with different classes. The only thing that we found lacking was tank classes. You can equip heavy armor and shields and focus on fat-rolling through the game, however rolling through boss attacks seems to be the better way to avoid dying, making the shield-focused build less powerful than those who dual wield. The above alone would be enough to keep you playing for way longer than you would any other 18 dollar title, but there is more. Exploration has always been one of my favorite aspects of the souls series, and Salt and Sanctuary has delved into it at a whole new level thanks to a fantastically complex world map. The Island features 22 named locations, all in one single interconnected and shortcut-rich world. In true Castlevania fashion, you will find ways to invert gravity, perform special jumps and even walk on thin air. These abilities are gained through “brands” and they double-perform as keys to progress further into higher levels and as ways to hide away items and Creeds in the most inaccessible of locations. It wasn’t until we accidentally discovered a complex jump puzzle leading to a secret sanctuary that we realized that we should carefully look up and down and around every wall and dead end to ensure there wasn’t some amazing treasure left behind. Salt and Sanctuary features offline couch co-op and pvp. In order to review this thoroughly, we played through the entire game in co-op, so we have a very good idea of how it works, and it is indeed a lot of fun. So much so that we feel the absence of online multiplayer is truly sad, but we understand that the developer could not fit it in with release date pressures mounting. Here’s hoping for an expansion or future patch that adds this. To play with your couch partner, you must first find a Stone Sellsword and place it at your sanctuary. The other player must have made a character in their account to be able to join, and once in your world they can live and die with you, gaining experience and loot as you play. Trophies are automatically unlocked for both players, however game progress specifically (keys, boss flags, etc) are reserved for the host. The camera also prioritizes the host, which can lead to rather frustrated sellswords when you have gone separate ways, but the overall experience is quite smooth, and it is certainly my recommended approach (it’s dangerous out there, don’t go it alone!). However there are a few drawbacks to being in a co-op session such as bosses and enemies quickly and unexpectedly changing directions and attack patterns, the screen being pulled in strange ways and players teleported to each other at inconvenient moments, and worst of all: you get confused about which is your character in the heat of battle. That said there are two significant benefits to co-op: one is that you can go into your inventory as your partner progresses and when you come out of it you will be teleported right to them – this can be used by your partner exploring platforming to avoid death. The other one is that during boss battles someone can revive you right at the boss arena, which is of course a huge plus for those wanting to complete the game without too much backtracking. It is also noteworthy that the developers have included asynchronous features via tombstones, candelabra before bosses and hanged players in the background. You can break a tombstone to see how other players day, or see them roaming about as shades in Sanctuaries, or see their hanging corpses near the boss they were killed by. So is Salt and Sanctuary worth it? Replayability: Absolutely. 20+ hours for the first playthrough and you’re only 1/5 of the level cap, New Game Plus is there for the taking and for obtaining the most powerful weapons as you continue to develop your character and fight harder and more rewarding bosses. Pricepoint: 17.99 is a bargain of a price for the amount of content included in this title. Heavy shield and Fat Build lovers: You will probably dislike this aspect and switch to fast rolls. Are you getting it? You will certainly want to visit the New Player Help page on the Official Salt and Sanctuary Wiki! We’re going to be streaming the game live on launch day with James and Michelle from Ska Studios on our YouTube Channel, so be sure to come and hang with us! Summary: An intimate, exciting and discovery-fueled experience, rich in content and secrets, will have players exploring and lorecrafting for months to come. The pricepoint sweetens the deal for any souls, rpg or castlevania fan looking for a new and satisfying experience. Put in my preorder from all the talk after watching the stream I’m excited to play through it. Can’t wait to see if they add online mp. I initially thought this looked good, then was lucky enough to get my grubby mitts all over the Alpha version. To be candid, I expected Castlevania style "weapon diversity." Essentially, apart from perhaps some swing speed, you just use whatever hits hardest and roll with that. Not even remotely the case. It really is Souls depth of diversity in many ways. Thanks for the great breakdown, Fex. Wow, I was on the fence, but after such good praises how can I not?! Just preordered it from my phone and can’t wait to dive in! "Heavy shield and Fat Build lovers: You will probably dislike this aspect and switch to fast rolls." I wanna stay up all night and play asap… But knowing how I usually am, I’ll be in asap in the morning. I was gonna tag you on this lol. 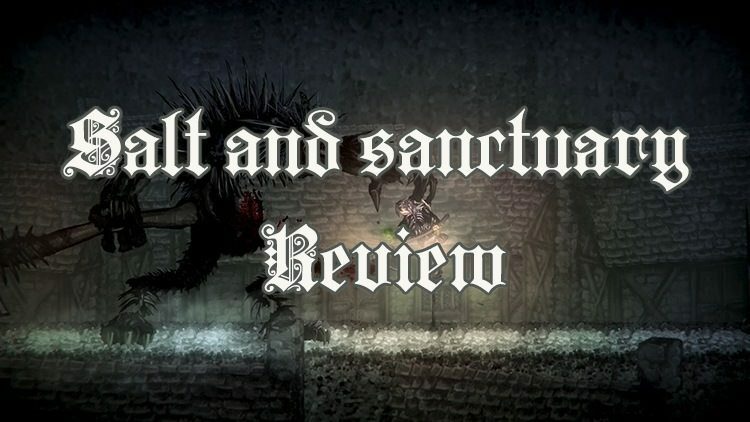 I just want to say one thing: After watching the stream last week, reading the review and reading these forums I can tell Salt and Sanctuary is like food made with love. You can feel it when you eat it. I played this at PSX a few months back. Loved it. Definitely ony backlog list. Great review. So how is everyone finding the review now that you’ve all played a lot? Just as good as when you first wrote it Fex. Gives a good summarization and impression of the game. Ive been playing for about half an hour, and its pretty clear that this is something special. This game is like Christmas for a gamer like me who loves 2D action/platforming, 2D metroidvania, and souls games. Like if there were SRPG elements in this game itd literally be a combination of all my favorite things about video games. Didn’t want to read this ’til I had started the game! An excellent write up for an excellent game!